It’s a nightmare situation, and we’ve all seen it on the news before: Water lapping at people’s roofs, furniture floating in inundated living rooms, and entire livelihoods swept away by floods. Almost any waterway can become a flood threat if the conditions are right. What would you do if you found your home facing a rising water line? 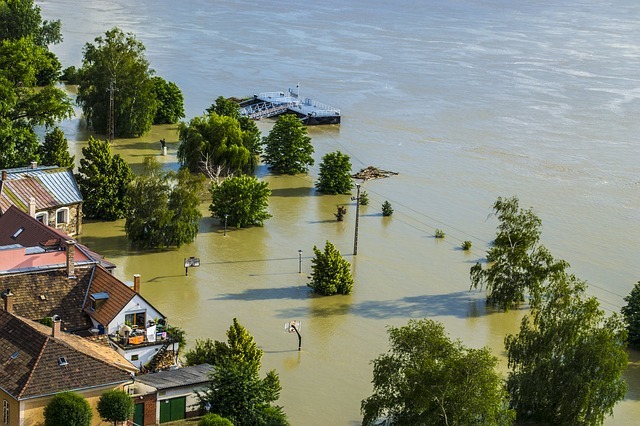 Most people don’t realize that basic homeowners’ insurance policies don’t cover flood damage. Think snow damage or hurricanes are covered by your policy? Check again. Many companies will not pay out for repairs from water events such as these. Premiums for flood insurance will vary based on home construction, year, and estimated risk. If you buy flood insurance while you’re engaged in the mortgage process, you may waive the 30-day waiting period. The U.S. government will not provide flood assistance unless the area is declared a disaster zone. If you’re selling a home in a flood plain, recognize that the flood insurance requirement may be viewed as a major negative in buyers’ eyes. Flood maps can change, so it’s a good idea to check floodmap.net for information. Flood insurance doesn’t necessarily cover everything in your home, so be aware of the terms of the policy. While the decision to purchase flood insurance is ultimately up to you, provided you’re not required by your lender to have it, you should ask yourself if the savings is worth the risk.